The Brown bear (Ursus arctos) – the biggest European carnivore – was exterminated from most of the Czech Republic during the 17th and 18th century. Like wolves and lynx, the bears survived in Slovakia and from the 1970s, they have been occasionally coming back to the eastern part of our country – the Beskydy Mountains. Bears have large territories and males in particular sometimes travel over the distances of hundreds of kilometres. The permanent return of the species to our mountains is hindered by illegal hunting, intensive forest management, and landscape fragmentation. The bear is the large carnivore species most threatened by the degradation of its natural habitats. For their survival, the bears need forest ecosystems with a diverse structure of animal and plant species and a high proportion of dead wood providing enough food and quite hiding places for them. 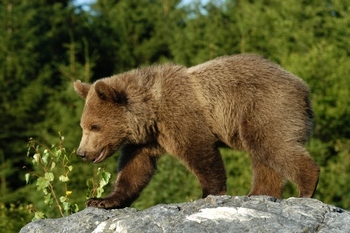 Although the brown bear is strictly protected under the Czech legislation, little is being done for the conservation of suitable bear habitats. The bear is the only European large carnivore that can, under exceptional circumstances, be dangerous to a human. But such cases remain very rare and we can avoid them by our correct behaviour. Other preventive measures include proper waste management and effective protection of livestock. No person has been injured by a bear in the Czech Republic. Current distribution of the brown bear in the Czech Republic (edited according to Červený et al., 2005).